Our IT services involve more than taking technical calls and support. 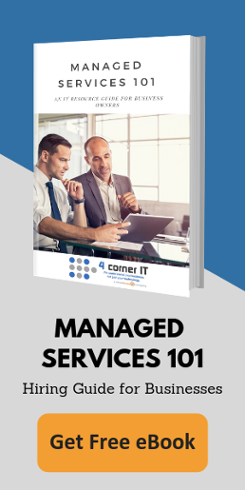 With 4 Corner IT, our consultants will not only maintain, but manage your company’s internal IT processes and evaluate your business to ensure that it has the technology it needs. But how do we do it? 4 Corner IT provides the best in consulting and implementation services for any business using a 3 step process: analysis, control, and progression. 1) Analyzing is the most important part of this process – where we determine what technologies and practices are best for your company. The fact is, many companies with great concepts fail everyday simply from under exposure, poor support, or a combination of both. 2) The next process, which is implementing and controlling those IT services, also includes maintaining the inner functions that make up the technical aspect of your company. This involves taking around-the-clock service calls, being available for more consultations, and scheduling progressive IT support when needed. 3) IT progression, which involves researching and changing IT solutions based on new technologies and business plans – all while staying in open communication with our IT consultants. Implement all these three strategies by setting up a meeting with one of our technical and business consultants and filling out the form below – we look forward to hearing from you soon! Our team of IT experts evaluates your IT plan or constructs a new one to match the technological efficiency and performance your company needs. As part of a low cost, flat-rate plan, our IT technicians will periodically monitor your IT situation and will promptly take action during any IT emergency. You will have open and scheduled access to one of our IT and Business Consultants who will consistently make sure your IT Support is kept up to par. We are South Florida’s premier IT support and managed service provider in Miami, Broward, and Palm Beach County located in Fort Lauderdale, Florida. Use the form on the left to contact us today!